Progress breeds progress: The Eterna Spherodrive energizes the new 3843 proprietary calibre driving the Eterna Adventic. Adventic. 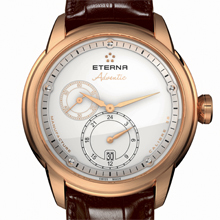 An unusual sounding name for a rather uncommon model: the first Eterna timepiece to incorporate the new Eterna proprietary calibre 3843, itself energized by an Eterna Spherodrive mechanism. This new round self-winding movement follows the introduction of hand-wound calibres 3505 and 3510. Providing the time of day with running-seconds subdial plus the date and GMT time, it now equips a design inspired to some extent by a Centenaire model of the 1960s, yet perfectly contemporary in style and spirit. Face, shape, finish – the Adventic radiates quiet elegance from every angle. It provides the hours, minutes and running seconds on a subdial, the date and GMT. Designed and decorated in keeping with contemporary tastes, its 44 mm case displays elaborate matt and polished finishing. Eterna's five-sphere symbol is everywhere: on the dial, on the applied minute circle as well as on the crown. There's even a double row of five grooves around the case. 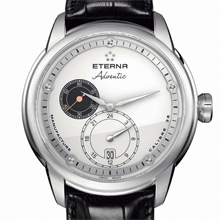 Such reminders of Eterna's signature graphics hark back to the 1948 Eterna-Matic, i.e. the fitting of the self-winding movement rotor on five diminutive steel ball bearings – which have since then become the brand's instantly recognisable symbol. 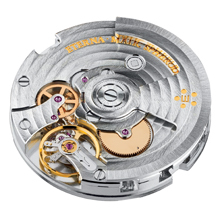 This same technical approach reappeared in 2009 with the Eterna Spherodrive mechanism. Its spherical bearings are now made of a zirconium oxide ceramic compound and fitted on three concentric rings that facilitate the rotatory movement of the barrel or barrels in the 3510 Calibre. The star of the collection for 2012, the Adventic's personality comes in part from a successful Centenaire design of the 1960s although its designers have tailored its clean, trim good looks to the tastes of today. The Adventic is currently available in a choice of three models: in stainless steel with black or white dial, both with black subdial for the seconds, and in 4N rose gold. A black or brown alligator strap fitted with a practical deployment clasp rounds out this attractive new timepiece's features. All functions are set by the crown. Movement: Eterna proprietary calibre 3843; self-winding movement fitted with Eterna Spherodrive system; power reserve 72 h; 28,800 v.p.h. ; 26 jewels; diameter: 30 mm (13 ¼ lines); 3 ball bearings; Glucydur balance wheel; hours and minutes, running second subdial; GMT counter; date calendar. Dial/hands: white or black, baton hour markers on circular satin-finished rhodium-plated or dark rhodium-plated applied minute ring enhanced with five polished spheres; rhodium-plated or gold-coloured centre hour and minute hands; black or white seconds subdial with gold-coloured or blued hand; date calendar at 6 o’clock; GMT counter at 6 o’clock with rhodium-plated or gold-coloured pointer. Case/back: case in polished and satin-finished stainless steel or in polished and satin-finished 4N pink gold enhanced by two parallel sets of five micro-grooves engraved on the case flanks; case back secured by 5 screws with sapphire crystal opening; water-resistant to 50 m (~ 165 feet or 5 bars); diameter: 44 mm; height: 12.5 mm; scratch-resistant, anti-reflective on both sides sapphire crystal; crown featuring the five-sphere symbol. Bracelet/clasp: fitted black or brown alligator leather strap with polished stainless steel or 4N rose gold folding clasp. Limited Edition: the gold version is limited to 50 pieces.